Greetings from Southern Mindanao Mission! Praise the Lord! 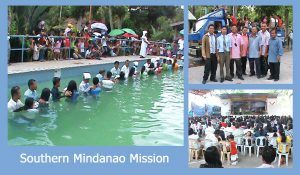 After 6 months of groundwork by 10 SMM adopted ministers and 8 laymen, 2 evangelistic meetings, satellite meetings in 10 churches, and a crusade by Pastor Violeto Bocala, Former President of Southeast Asia Pacific Division, a total of 828 precious souls were baptized in Surallah, South Cotabato, Mindanao, Philippines. The adopted ministers spent three months of post baptism nurture. We thank the sponsors of Adopt a Minister International for your prayers and financial support of our adopted ministers. God bless you!! !